It’s a sad day over at the Huffington Post and left wing blogs like Mudflats and Celtic Diva’s Blue Oasis. You see, despite their best efforts to smear Alaska Governor Sarah Palin with more than a baker’s dozen of phony ethics complaints since the start of the year, all of their efforts have completely failed. The latest complaint to be dismissed was incredibly ridiculous. 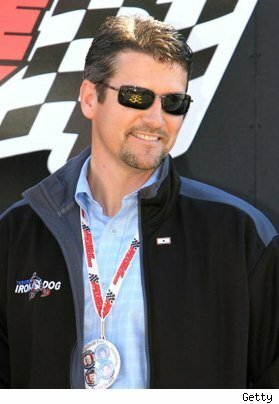 It revolved around the fact that Governor Palin, in sub zero weather, had the temerity to wear a jacket when she attended the final day of the Tesoro Iron Dog Race! The Iron Dog is the world’s longest and most difficult snow machine race. (snowmobile to us in the lower 48) The Governor was waiting at the finish line in both her official capacity as well as the wife of one of the competitors, her husband Todd, and his partner, Scott Davis. The Iron Dog is a grueling 1,971 mile race through some of the toughest conditions one can imagine. It is a true manly-man sport! Palin and Davis are two of the best, having 11 wins between them in the event. To tell you how tough this race is, last year Todd finished with a game fourth place effort after a crash slowed him down, and he rode the last 400 miles with a broken arm. So what was the issue? 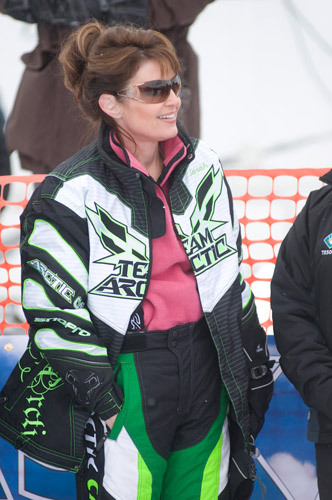 Well, you see Governor Palin was wearing an Arctic Cat jacket. 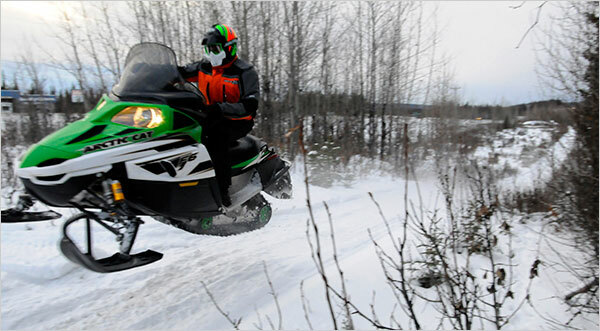 Arctic Cat makes snow machines and yes, they sponsor Todd and Scott. Oh the humanity of it all! And so, another baseless and comical ethics complaint was born from the ankle biters on the left. This particular complaint was filed by a nasty woman named Linda Kellen Biegel. She is hostile to Governor Palin, and runs a website, Celtic Diva’s Blue Oasis, that is dedicated to not only spreading this woman’s hate for Governor Palin, but also coordinating attacks against her with other bloggers and members of the press. Biegel who, according to her own website, is an official blogger for the DNC, has helped publicize the numerous phony harassment complaints against the Governor. In fact, the woman is so notorious for doing this, and then crowing on her website about it, that she actually inspired a group of talented conservative bloggers to create a very funny parody website that is spot on in it’s humorous depiction of her. Now by herself, Linda Kellen Biegel would just be a sad character with a lot of time on her hands. But Biegel is far from being alone in this. One has to understand that in Alaska, the far left is a small, but very well coordinated, and funded group. And they have some very big help. Lets meet just some of the players who participate in these smear tactics. There is fellow hate blogger Jeanne Devon. Devon runs a particularly nasty website know as Mudflats. Now unlike Biegel, Devon didn’t have the guts to blog under her real name. Instead she chose to spread hate and lies under the alias AKMuckraker. 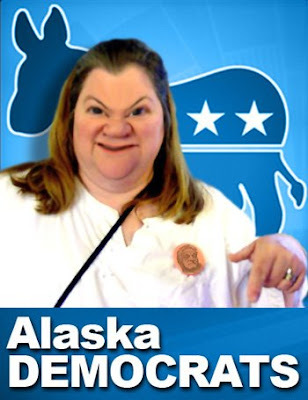 This woman is so hateful in her approach, a democrat, Alaska Representative Mike Doogan outed her to the media. Devon and Biegel are very much the coordinators of the attacks against Governor Palin. Along with a couple of smaller bloggers. And yes, they have even went as far as recruiting folks to help file complaints against the Governor. Now in Alaska, the ethics board doesn’t put out press releases when complaints are filed. They do however report the finding of all investigations once complete. Of course, that wouldn’t help the democrat bloggers one bit. So they have help from so-called reporters. Meet Amanda Coyne. Coyne is a college professor who…wait for it… teaches journalism. She also runs a for profit website that is pretty much dedicated to causing Governor Palin grief. Coyne, who claims to be Governor Palin’s “first official biographer”, also writes for the far left Huffington Post. Now the Post isn’t all that important, so Coyne has an ace-in-the-hole, her husband, Tony Hopfinger, who works for the Anchorage Daily News. Hopfinger, who also freelances, makes sure the ADN is full of less than flattering stories about the Governor. This writer, and others have had issues with the Anchorage paper for some time. The ADN had the habit of allowing absolutely anything, no matter how disgusting, to be said about Palin in their online comments section, while deleting supportive comments. After some investigating, we found that many of the most hateful comments, from people claiming to be Alaskans, were actually bloggers, and a newspaper columnist or two from the lower 48. It got so bad that a group of readers actually promised protests and advertiser boycotts if they didn’t clean up their act, which they have since done, to some extent. Now helping out Amanda Coyne, is fellow HuffPo writer, Shannyn Moore. The malicious content of her writing speaks for itself. Moore has the worst case of Palin Derangement Syndrome imaginable. Why are people like Coyne, Hopfinger, and Moore important to these hate bloogers like Biegel and Devon, and the DNC’s plans? Well, remember, the State of Alaska isn’t in the habit of publishing complaints when they are filed. And yet, most of the nation’s left wing blogosphere knows about the complaints, often before they are filed. This is where the HuffPo writers come in. They are tasked with writing story after story of how supposedly corrupt Governor Palin is. And of course, the rest of the media picks up on these stories and runs wild. And while the complaint makes national and even international news, the fact that it was thrown out, and completely ridiculous, rarely gets reported. This is business as usual for democrats. It’s how they work. There are other serial ethics complaint filers, like Andree McLeod. It is said that she is angry because the Governor wouldn’t give her a job. And who am I to say different. Like a lot of the left wing, she claims to be a victim of something, and says she would file many more ethics complaints, if not for the fact “they” might get her. And yet, she is constantly talking about filing more ethics complaints! McLeod filed an ethics complaint because Governor Palin announced she had been chosen as John McCain’s running mate on her website. She also complained because the Governor attended a Republican dinner. According to Eddie Burke, of the Eddie Burke radio show, McLeod was recently seen dining with Alaska Democrat State Senator Bill Wielechowski. Wielechowski has denied any collaboration with McLeod though. While McLeod has filed some really hilarious complaints, she is not alone. There is a fellow named Chip Thoma, who has complained because the tour buses drive by the Governor’s Mansion, and even complained because the Governor’s young daughter, Piper, set up a lemonade stand! Chip has unsuccessfully sued former Governor Walter J. Hickel saying that Governor was “out to get him”. Now as I said earlier in this piece, all of the would either by funny, or pathetic, depending on your mood, if it wasn’t so malicious. Thanks to these complaints, and the Barack Obama initiated “troopergate” fiasco, Governor Palin, who is not a wealthy politician, has had to start a defense fund to help pay her legal bills. And yes, the ankle biters filed a complaint against her for doing this, as well! These bogus harassment complaints have also cost the State of Alaska around $300,000, prompting many Alaskans to call for a change in the law that would force the folks who file these sort of harassment complaints to have to pay for them. But what is the end game in all of this? Well, as I mentioned in an earlier piece exposing George Soros’ connection to the ethics complaint CREW filed against the McCain-Palin campaign, which itself was thrown out by the FEC, this is standard practice for the democrat party. Groups like CREW, Citizens for Responsibility and Ethics in Washington, use the legal system to harass their opponents. It’s one of the “Rules” set forth by Chicago communist Saul Alinsky, whose book on community organizing, “Rules For Radicals” sits on the night stand in most democrat politician’s and activist’s bedrooms, whether they admit it, or not. With Governor Palin, the end game is even clearer. Unlike most politicians, who talk a good game about ethics and reform, Governor Palin has a solid record of actually doing it. She actually walks the walk, and doesn’t just talk the talk. 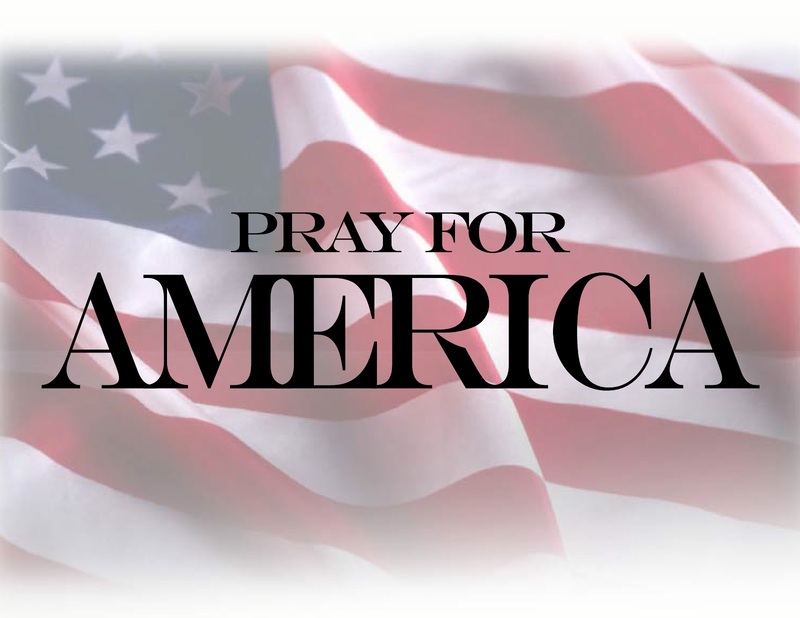 As Palin biographer Recaldo Ochoa points out in his book, “Sarah Palin, Poised To Become America’s First Female President”, Governor Palin was a reformer from the very start. In her earliest days in politics Palin came upon a situation that she felt wasn’t right. Her friend, and the person who actually talked her into running for her city council spot, Nick Carney owned a waste management service. Not a problem in itself, but he was pushing through an ordinance that would have given his company a monopoly on waste pickup in and around the Wasilla community. Friendships aside, Palin felt this was wrong, and actively fought to make sure this didn’t happen. This sort of basic common sense would follow her into the Mayor’s office. Now once she had served her two term limit, Sarah Palin looked for another challenge, and ran for Lt Governor. She lost. But she also impressed a lot of folks in Alaska. The Governor, Frank Murkowski, saw fit to appoint her as Chairman of the Alaska Oil and Gas Conservation Commission. A top position in the oil rich state. Unfortunately, it wasn’t long before Palin found there were some serious problems in her agency. Two of the highest ranking players in the Alaska GOP, party head Randy Ruedrich and former Attorney general Gregg Renkes had some issues. Renkes had some conflicts of interest with a coal contract, and Ruedrich was basically blowing off his job in favor of doing party business. This is the exact sort of thing that makes the average American distrust all politicians. Palin took this to her boss, the Governor, who was less than receptive. Now, she could have just went on, and continued to work as head of the agency. After all, this was a good paying six figure job. And her star was really on the rise. She could have “played ball” and it would have been smooth sailing. She would have been set for life. Sarah Palin didn’t do that. She resigned from her job and took these people on. For most folks, this would have been career suicide. But not for Sarah Palin. Both Renkes and Ruedrich were forced to resign from the agency, and Ruedrich was fined $12,000, the largest fine of it’s kind in state history. Palin went on to challenge Governor Murkowski in the Republican primary, beating him in a landslide. She then went on to defeat popular former Governor, Tony Knowles. 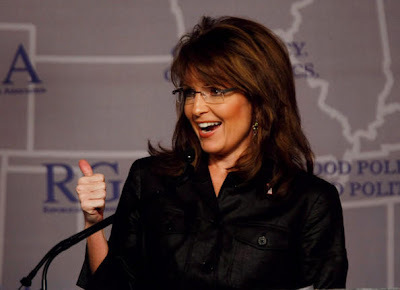 The point is, for nearly two decades Sarah Palin has been a true, honest, and ethical politician. Someone who doesn’t care who the person is, or what party they belong to. If she sees something that isn’t right, she will point it out and work hard get it stopped. Of course, this sort of person is not a welcomed sight on the national scene. At least not by the average politician! Someone like Sarah Palin is a direct threat to any politician, no matter the party, who is corrupt. The establishment in both parties see her as a direct threat. So here come the ethics complaints hard and heavy. From the so called “troopergate” complaint that was encouraged along by Barack Obama, to all of these harassment complaints filed and coordinated by the many left wing bloggers, to the phony complaint filed by CREW, the democrats, and I suspect some worried Republicans, are doing everything they can to take away the reformer mantle from Governor Palin. To basically take it off her resume. Don’t fall for this sort of nonsense. It’s just dirty politics at it’s worse. This one is an easy choice to make!